I absolutely love being apart of the Kelloggers Network. Not only do I get to try some of their new and latest products, but I also get surprises in the mail to create some oldies, but goodies, Rice Krispies Treats. And this time we were to make them as spooky as possible, which was something the kids were super excited about doing. 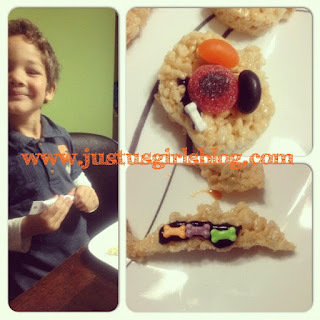 Rice Krispies treats are hands down my son's favorite snack to have and when he found out that we would be making these when him and his sister got home from school on Friday, he was super excited. We were sent a box that included Kelloggs Rice Krispies, Marshmellows, two cookie cutters shaped as a pumpkin and a bat and candy to decorate our creations. I have to say the kids and I had so much fun making these treats this last Friday. 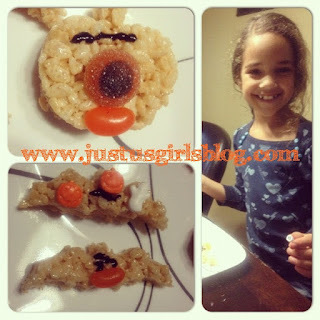 We got to make Halloween treats that were kid friendly and easy for the kids to help with while listening to Halloween music and after our creations were done we sat down in our family room watching The Adams Family eating our treats and popcorn. It was a fun time for all. 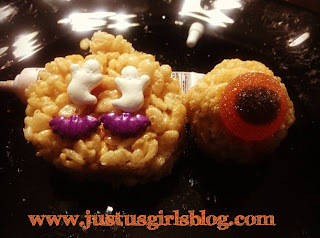 To get ideas on how to make your Rice Krispies Treats spooky this Halloween, check out their website for tons of recipes! Disclosure: All opinions are my own. I am a Kellogger and receive products to test out and share. No post was required. No compensation was received.